You would have been into the situation where you were requested to apply security on the OBIEE exposed objects. First level of security that we are going to discuss now is folder level security (this implies granting access to both folders as well as dashboards) through managing catalog security. Browse through your catalog until you reach your desired main folder/object on which you want to apply security. Our example shows application on the OBIEE folder “Shared Folders/00. 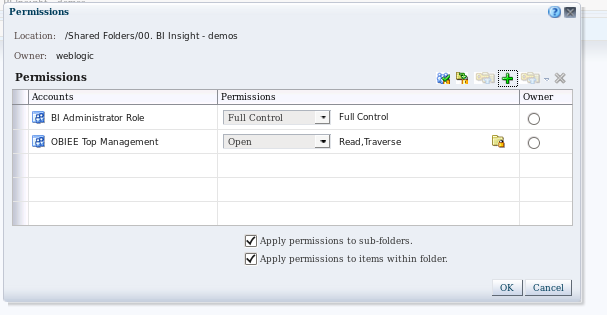 BI Insight – demos”. Select the folder from the tree at the right side and then click Permission from the bottom of the right column. Second option is selecting parent Folder from Tree view column, then select folder from list view column, and click on “More” link. A Permissions option/link will appear. then select the type of Permissions you want to grant and click OK. Custom permission allows any combination of the available rights on the right. As a test, I’ve logged in with my test user a_test (member of OBIEE Top Management application role) and I can only see my selected folder in the Shared Reports folder. The second option of implementing this type of security is using the Catalog Manager tool. 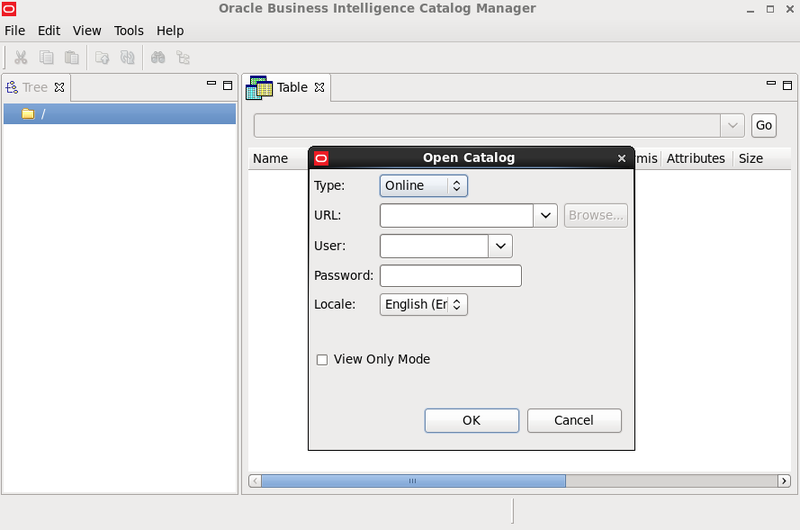 Please note the view provided by the catalog manager or namings will depend on your version of OBIEE. However, principles explained in this blog will still apply. When selecting a given folder you can access various options, like Copy, Cut, Rename, Smart Rename, Create, Permissions and Properties. or managing your folders content. allowing adding permissions, changing them or removing them. You can apply changes Recursively, however this will apply them to both Sub-folders and items within the folder. There is no distinction at this level between the two types. The effect on both security implementation options (Catalog Manager/Front End) is similar for the end user. There are various test cases when you might choose using the Catalog Manager over the Front-End setup of security. In this type of scenario, Catalog Manger will allow you access to user’s folder. Solution is to re-grant the user Full Control to his own folder – applied recursively. Note: Please note this tests were done on OBIEE 11.1.1.7.1. This entry was posted in OBIEE and tagged cannot see my folder, catalog manager, Catalog security, folder permissions, OBIEE Security, problem with creating saved selections, unable to access saved selections. Bookmark the permalink. This is good. But how do we apply Full Control to all users recursively in one go who are in ‘Additional users and groups list’ section when we open catalog offline. I have moved them them ‘Users and groups (Explicit Permissions)’ section but applying full control to all user folders in one go looks to be limitation for now. If you know a way please let know. I believe there is a simple solution to your puzzle. 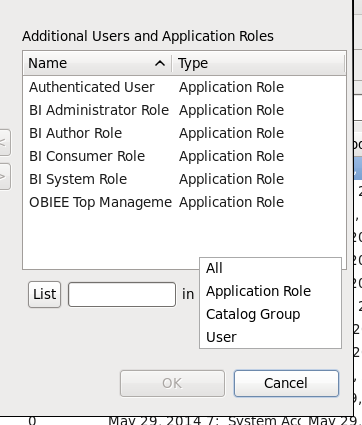 You cannot select all users in the list of “Additional Users and Application Roles” to add them all with same right on a item in the catalog. However, if the scope for your action is for you to grant access to any user who will login into your system to that object, the easiest way is to grant access on that object to a role encompassing all your users. One such role, is the BIConsumer role. However, the one role who will grant any user who can login to your system access (any user who passes the login will have) is the “authenticateduser” Application Role. Please do comment if you found my answer useful. Thanks for your nice blog regarding OBIEE catalog permissions & privileges. I have a question to inquire: can we grant a developer to upload catalog reports to PRD without allowing them to do development work directly on that environment? In order to upload reports, the user has to be granted write permission, right? Many thanks. From what i have seen and tested so far there is no way to allow a user to do the archive-un-archive action on a BI server without him having the right to write on the server. However, if the user does not have access to any Subject area, or other extensions (e.g. Answers access), the actions for creating might get limited to the migration alone. Have not tested this but might try it during the next couple of days and come back with the confirmation.